I’ve been using IK Multimedia‘s Amplitube 2 for a while now, and I find it an especially handy songwriting tool which allows me to test parts out with a variety of different amp and pedal combinations before settling on how the hell to do it live on stage. Fender was already bitten by the modelling bug a couple of years ago when they paired up with Boss to release a few pedals which emulated Fender amp tones. Now the modelling bug has well and truly sunk his fangs into Fender’s tweed-covered hide in the form of Amplitube Fender. AmpliTube® Fender® is the only official Fender® guitar/bass amp and FX software suite, made by IK Multimedia in cooperation with music icon Fender® Musical Instruments Corporation. With a collection of 45 pieces of gear, including some the most sought-after classic and modern Fender® amps (Twin Reverb®, ’59 Bassman® LTD, Super-Sonic™, Metalhead™ and many others), cabinets, stompboxes and rack effects, AmpliTube Fender® sets the new standard for software amplifiers. From guitar to bass, and from country to blues, rock, punk and metal—whatever style you play—AmpliTube Fender® is the only amp suite that gives you the world’s most influential guitar and bass tones right on your desktop. The extremely accurate Fender® tones achieved by this collaboration, together with the large variety of gear included, covers the widest range of tonal palettes and makes AmpliTube Fender® the ideal choice for those who are recording guitar for the first time or for DAW users who demand nothing less than tonal perfection. Incredible tone flexibility; mix and match amps, cabinets, mics and more. Sound-certified and approved by Fender®. Includes SpeedTrainer™ and Riffworks™ T4 recording software. Can be expanded with additional “Powered by AmpliTube” models using AmpliTube X-GEAR. Can be controlled live with StompIO, StealthPedal™ and any traditional MIDI controller. Hundreds of presets included, with more that can be downloaded from the AmpliTube preset XChange area. Powered by AmpliTube® with exclusive DSM™ (dynamic saturation modeling) and new VRM™ (volumetric response modeling) technology. The official Fender® guitar and bass, amp and FX software with 12 amps, 12 cabinets, six stompboxes, nine mics and six rack FX. Also includes Riffworks™ T4 for guitar recording and AmpliTube X-GEAR for full expandability with any “Powered by AmpliTube” software and live control. MSRP €169.99 / $229.99 (excluding taxes). The easiest way to plug your guitar into your computer and get the legendary tone of Fender®. Including StealthPlug USB audio cable interface and AmpliTube Fender® LE (four amps, five cabinets, two stompboxes, two mics, two rack FX), plus Riffworks™ T4 for guitar recording and AmpliTube X-GEAR for full expandability with any “Powered by AmpliTube” software. MSRP €109.99 / $139.99 (excluding taxes). AmpliTube Fender® and AmpliTube Fender® Studio will be available through the entire IK sales network of dealers and distributors by the end of February 2009. Preorders are already available through selected dealers around the world and in the IK online store. Last year I reviewed one of those awesome new Taylor solidbody guitars for Mixdown magazine. Its Gretsch-inspired pickups sounded so great that they prompted me to order the similarly-voice Dimarzio EJ Custom pickups for my custom Ibanez project (which I still haven’t finished, boo). Anyway, my point, even though it’s taking me a while to get to it, is that Taylor’s electric guitars are amazing. Following the success of the T5 and SolidBody models, and born from a love of innovative design and classic electric tone, Taylor Guitars is expanding its electric line with the company’s first purely electric semi-hollowbody guitar, the T3. While the T3 offers plenty for any player on its own, the designers at Taylor decided to take the new line up a notch in a variation, the T3B. Marking a first for the company, the T3B includes an authentic Bigsby Vibrato (model B70). The T3B incorporates a roller bridge for high performance, allowing the player the independence in setting the intonation of each string and eliminating the “dragging string” sound so commonly found in fixed bridges. The standard T3 model comes with a stop tailpiece. 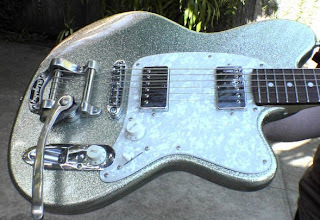 “This is one rockin’ guitar that produces sounds our SolidBodys and T5s don’t have. When you do something that looks good, that’s one thing, but when cool sounds start coming out, you go, ‘Man, that’s just it.’ We knew this guitar was too good to hold back,” shares David Hosler, lead designer. The new model includes Taylor’s Style 2 humbuckers which are specially positioned to capture the T3’s fidelity and range of tones. A three-way switch covers three standard configurations of pickup switching and as an added twist, coil splitting is available for both humbuckers by pulling up on the volume knob. “The way I describe it is, imagine you have a guitar with two humbuckers and a three-way, and you have a guitar with two single coils and a three-way, which gives you that really cool, ‘bitey’ sound,” adds Hosler. The T3 is available in a high gloss finish to highlight the naturally lustrous color of the quilted maple or in a variety of sunburst colors. Strung with Elixir light gauge electric strings with NANOWEB® coating (” target=”_blank” ref=”nofollow”>), the T3 comes ready to gig in a hard shell Taylor case. The T3 and T3B will be available domestically in mid-February and internationally in early spring 2009. I’m sure there will still be a few NAMM 2009 press releases filtering through for the next week or so (I’ll be adding a bunch of new stories tonight), but now that the bulk of NAMM news is in, what are your personal highlights from this year’s new gear? If you wanna refresh your memory, you can see all my NAMM coverage by clicking THIS LINK. By the way, anybody else notice that there was no big Dave Mustaine/Marshall announcement? Dave’s been talking for months about a new signature Marshall product, and there are various rumours that it’s either a variant of the JVM series head, a rackmountable JVM preamp, or even a new MIDI tube preamp to fill the gap left by the discontinued JMP-1. I’ve contacted Dave to see if he can shed any light on the story, and I’ll report back if I hear from him.